Fortinet Devices Tips/Tricks and Rants. Works in 5.2.x and up. Restoring the image to the primary partition will trigger an immediate upgrade/downgrade including reboot. 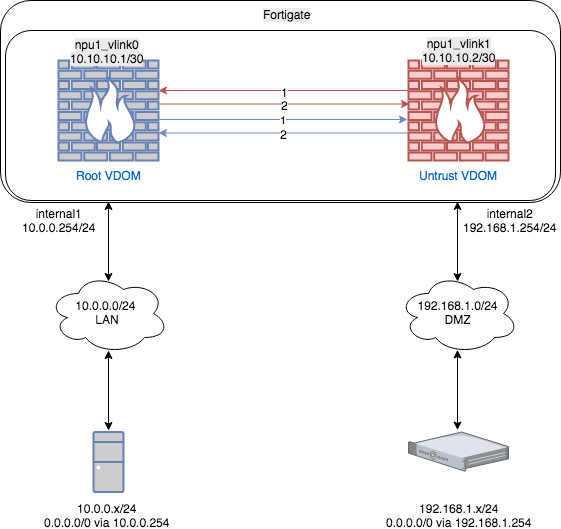 In this example we will be setting up inter-VDOM links between a VDOM named "root" and another VDOM named "untrust". This will allow bidirectional traffic to traverse the 2 VDOMs without any additional cabling. set srcaddr "all" #Do not leave as all. Lock down. set dstaddr "all" #Do not leave as all. Lock down. set service "ALL" #Do not leave as all. Lock down. Our goal with this config is to inspect/restrict traffic sourced/destined from servers on our LAN without causing much impact to the existing network. Failing to specify VLAN, Forwarding-domain and strict src/dst addresses may result in a Layer2 loop/broadcast storm. Please make sure to follow the directions carefully. c. Do not power on the Virtual machine after deploying. 2. 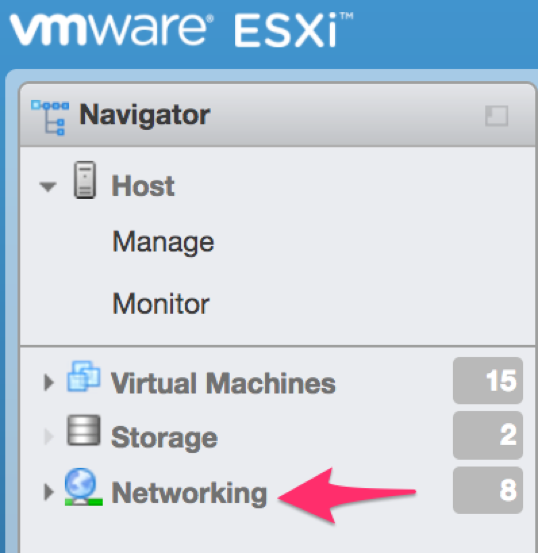 Shut off your VM servers that you would like to add to the port group so that we may edit their port assignments. Make sure that you assign a unique vlan id here. 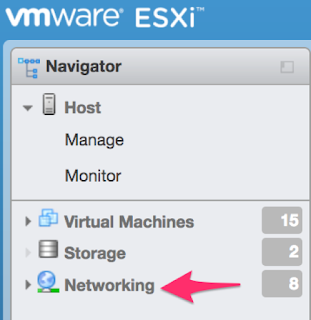 Edit your server VM and assign the network adapter to your new port group. Disconnect all ports that will not be used. You will need 3 ports: In/Out/mgmt. Port1 for out to our network. Port8 for connection the VM port group. Your port group should now look something like this if you had 2 servers in it. The only exception is that your ports are not green as we have not powered anything on yet. 4. Power on your FGT VM and console into FortiOS CLI. 5. As a precaution, we should shut all ports. 6. Set the box transparent mode. #this will log you out so log back in. 7. Set DNS and static route if needed. 8. Set the forward-domain for your interfaces that are not used for management. 9. Set the allowaccess for your mgmt. interface. 10. 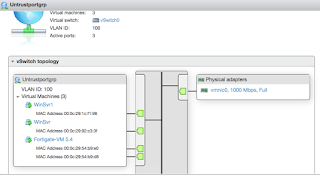 Setup the in/out firewall policies for your Server communications. It is very important that you set specify srcaddr/dstaddr to avoid layer2 issues on your network . 11. 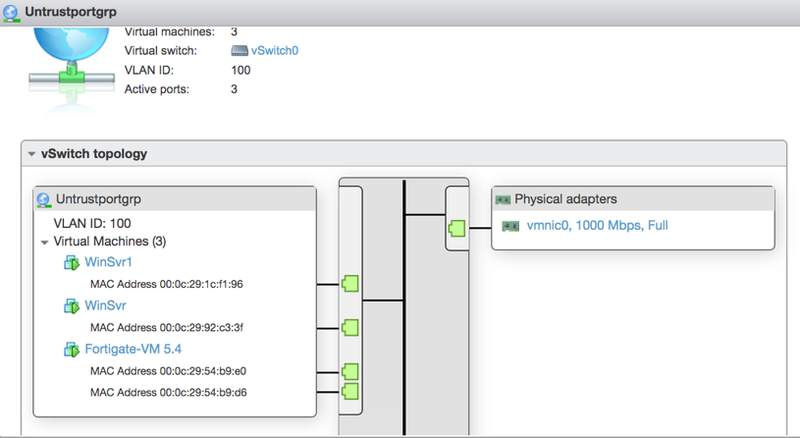 Enable your 3 interfaces on the FGTVM and power on your VM servers. 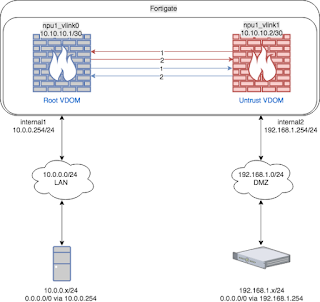 Traffic towards your servers should now be routed through your FGTVM and the FGT should be accessible via the management IP. Go back and apply any UTM policies, restrict services, etc in your policies that you may require. How to setup a custom FortiClient install.